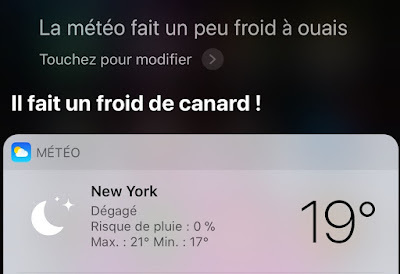 Heavens to Mergatroyd: Il fait un froid de canard! I commented to Siri that it was a little cold. Siri responded that the weather is "cold of duck." 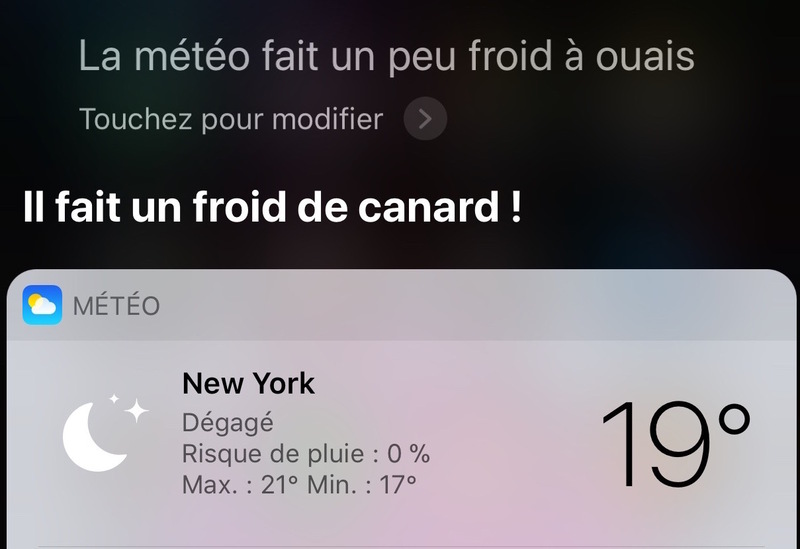 Apparently the French expression for very cold temperature is "il fait un froid de canard!" which means literally "it makes a cold of duck" and which means effectively "it's duck-cold" or as Google translate has it: "it's freezing cold." The French language also has an odd relationship to cows. If you say: "La glace à la vanille est vachement bonne!" it translates into "The vanilla ice create is really good!" But what you actually said was "The ice cream vanilla is cow-ly good." Since "vache" is the word for cow and "ment" is used in place of "ly" in French to indicate adverbs. I suspect vachement came into use because it's pretty close to "vraiment" which means "very" too. I'll even speculate further that vachement is a type of baby-talk, since probably French children have as much trouble with getting the hang of the throat-abusing R sound in the language as we English speakers do and thus vraiment comes out sounding like vachement. But that's just my theory. But I'm completely baffled as to how "duck cold" became a thing.